Getting the right tone for your room is no easy task, and a luxe is difficult to achieve without professional input. It is the finishing touches and finer details that pull the appearance of a home together. We at Deco-Furbish Painters and Decorators provide a clean and sharp finish to every wall and furnishing. Our team has a passion for precision, spotting and mending design flaws. Able to make outdated rooms look like new, our team knows how to give every space an update. We provide a free in-home consultation to get a better look at the space and to be able, to provide a correct and detailed quotation. Colours, fabrics, lighting, and furniture all have a massive impact. We suggest a combination of colours and finishes, that will open up a room. Modernising an outdated space can be all it takes, to fall back in love with your home. Staircases and hallways are often mistreated, even though this is the first room of a house one enters - and it also conveys a first impression of the owners. There are thousands of hall design ideas and we will assist you in finding the suitable decor for you. and if you have another painting and decorating requirement, we surely will find a solution to realize your ideas. 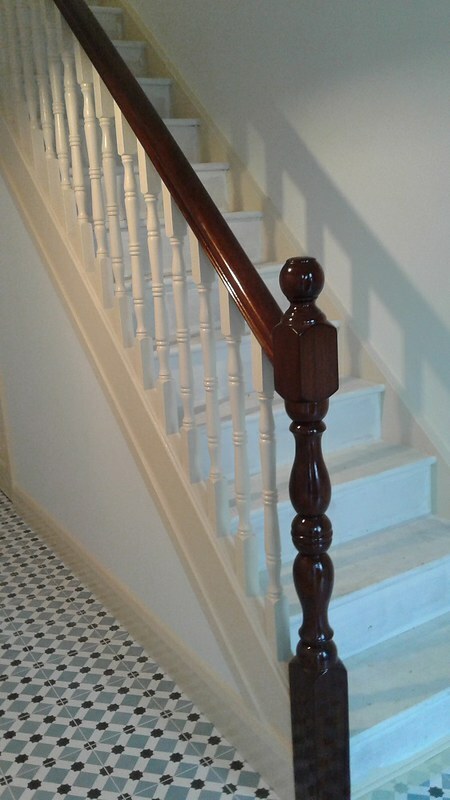 Click on our album (on the right) and you will see a collection of recent staircase and hallway projects in Cork, Kinsale, Blarney and Clonakilty. "Outstanding. This painting company are really masters of their trade and I will definitely be using them again. My walls look freshly plastered as a result ofthe prep work and final finishing is blemish-less !! They really do hold themselves to the highest of standards. Thank you Joseph, Rory and Marion. I will be back!!" A new kitchen can be extremely expensive - it's something most of us want to avoid, if at all possible. And often enough the kitchen still is much too good to be thrown away, such as this kitchen (picture on the right) of 25 years age, but solid mahogany. We will sand, prime, repair, top-coat, finish or replace any aspect of your kitchen cabinetry. Deco-Furbish is trained in making the most of what you already have, whether it's a new coat of paint or converting drawers to soft close. We will provide some fresh and inspiring kitchen design ideas on how to make your kitchen look brand new. 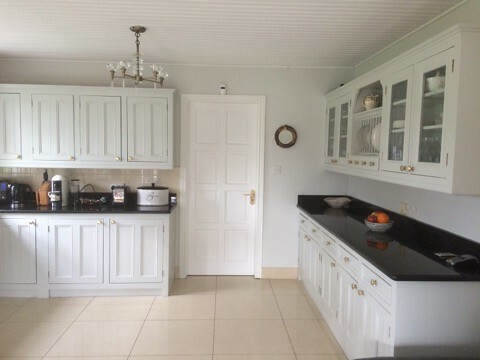 We at Deco-Furbish Painters and Decorators Cork are proud of our ability to work within even the tightest parameters to deliver lasting results which offer stunning looks and quality. 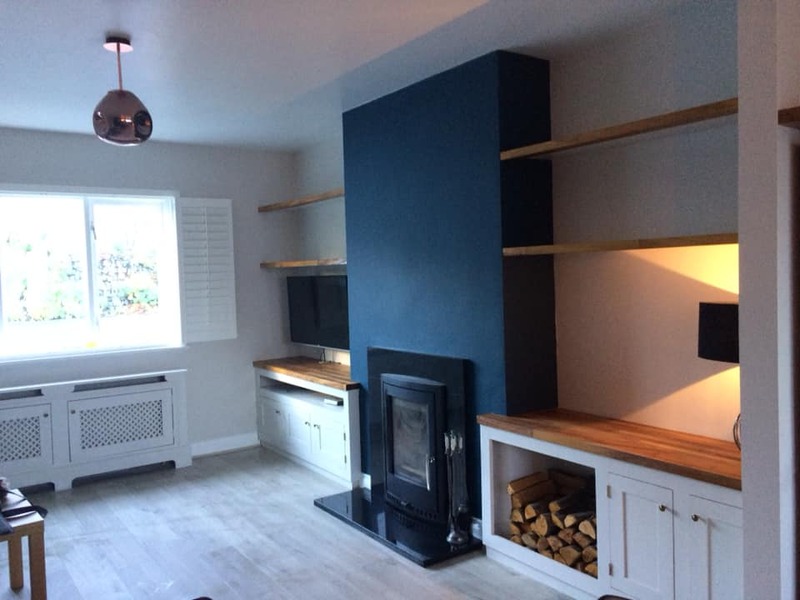 Click on our album (on the right) and you will see pictures of hand painted kitchen cabinets and wardrobes, recently performed in Clonakilty, Cork, Kinsale and Ballydehob. On your enquiry, an appointment will be arranged in your home to provide you with an in-depth and totally free consultation. This allows a member of the Deco-Furbish team the opportunity to provide any design ideas, inspiration, information on products, finishes, colours and problem solving such as repairing cracks. Following our meeting we will issue a detailed, written quotation which we adhere to - ensuring there are no hidden costs. We will be happy to discuss the quote with you and answer any questions, that you might have.